Hello! Welcome to day 3 of Taylored Expressions November Sneak Peeks! We are releasing several new stamps & dies, 2 embossing folders, 1 cutting plate, and 4 new cardstock colors! All products will be released tomorrow @ 7 AM PST. First I have a fun gift giving idea. I've used the Take Your Place die (perfect for making placecards for a table setting) as a treat topper. I put some treats into a bakery bag and slipped the topper over it. The holly image is from Set the Season and sentiment is from Small Packages. Next I have a card using In Other Words - Tea. The image was stamped, colored, fussy cut and popped up onto my layout. I've used one of 4 new cardstock colors on my card. Here my base is out of Poppy Seed, a beautiful dark grey. Accessories: Taylored Dies: Take Your Place, From Me to You coordinating, Gingerbread Lane sequins (TE); Corner rounder (Zutter), Markers (Copic), Wink of Stella glitter brush pen, Pearls, Foam tape, Thread, Sewing machine. Accessories: Taylored Dies: Label Stacklets 6 (TE), Markers (Copic), Burlap trim, Burlap twine, Pearls, Foam tape, Thread, Sewing machine. 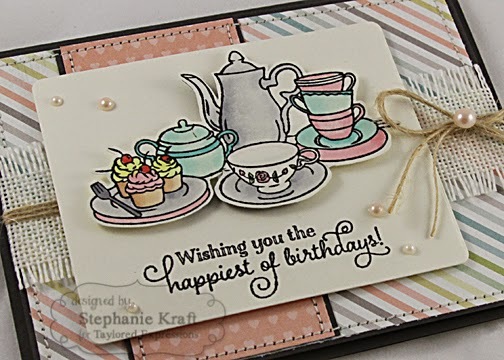 Beautiful card with the tea set! 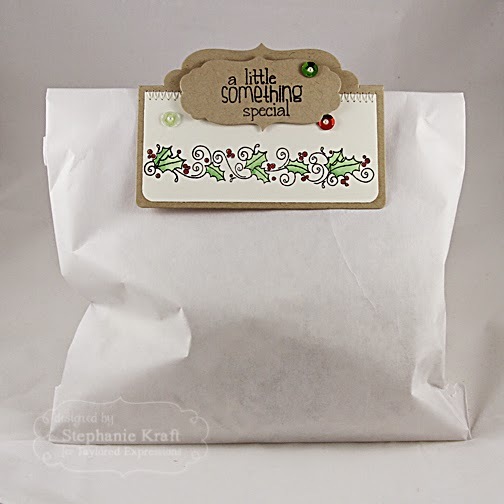 And love your use of the name card as a treat bag topper and love the stitched detail on them! 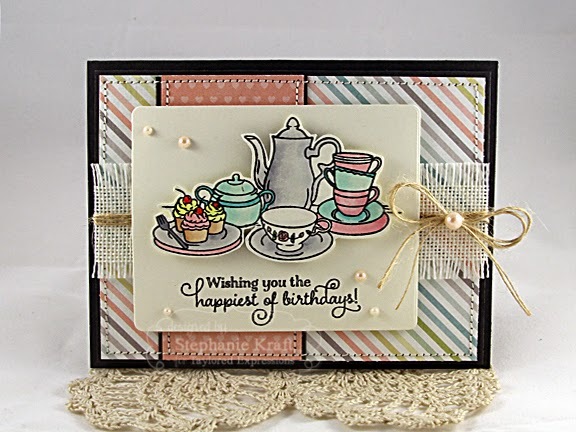 cute treat top topper and your card is beautiful! 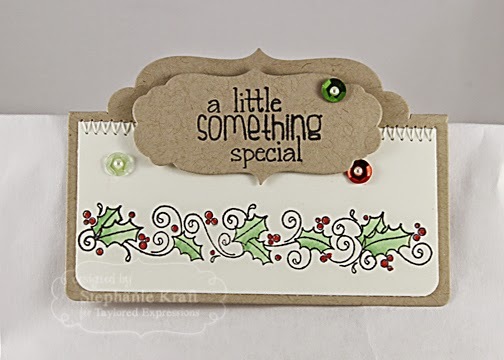 Such pretty projects Stephanie! Love all the little pearls and sequins! Hope your chicken soup was yummy!